The hinged seat opens to reveal a generous storage compartment for umbrellas and gloves. Plan shows a simple method of upholstering the panels in the seat and back. Plan also includes patterns showing how to add arm rests to bench if desired. Patterns for all curved pieces of this project are drawn FULL SIZE. Bench measures approx. 35"H x 38"W x 17"D. Order hardware parts package separately below. 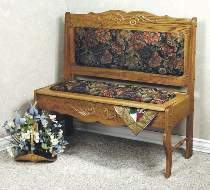 Upholstered Hall Bench Hardware parts package includes two 11" oak spindles, hinge, screw hole buttons and embossed wood ornaments. Project plan, upholstery materials, wood, and wood finish are not included.